Six o’clock in St Ann’s Church was time for some stepping around in time as part of this year’s world premiere Manchester Jazz Festival commission. Our time travel guides were 'The Felonious Monks’ led by Mike Hall on tenor sax plus various other horns, and Debbie Rogers on alto sax, vocals plus various other horns. The Felonious Monks explored the fusion of early Renaissance music with contemporary jazz, using a mixture of modern and replica C16th instruments. Compositional devices of the period were employed to structure the compositions, introducing vintage timbres to the existing jazz palette. This concept could easily not have worked, but Hall and Rogers pulled it off with aplomb, clearly having given a great deal of thought to the involved arrangements, as well as putting a lot of time into rehearsal. Many musician’s comfort zones were stretched to include playing crumhorns, shawms, cornamuses, cornetts, sackbuts, and gemshorns to name a few. The first 16th century sounds we heard came trumpeting out from the church balcony, these players then joining the main band at the front of the stage. Second track ‘Ballo Francese’ bluntly juxtaposed short sections of early music interspersed with short sections of full on bebop. It shouldn’t have worked, but did so gloriously. ‘Robyn’s Lament’ started with some vulnerable period singing from Rogers, Simon Lodge (otherwise on trombone) and double bass player Steve Berry, the latter reaching impressive falsetto heights. I’ve never heard this style of period singing in person before and really enjoyed it. Probably my favourite was the blues based ‘Of The Night’. The track shifted into a classic Coltrane style vamp, the modal chords fitting the sounds of the period instruments really well. This perhaps shouldn’t be so surprising given the crossover of the modal approach between these distant musical relatives. George King on piano vamped out some tasty McCoy Tyner style voicings, Steve Waterman then giving one of a number of blistering solos, this one on the flugel horn. Berry delivered a touching solo double bass intro to the melancholic horns and vocals of ‘Three Part Intention’. The set closer, ‘Time Trip’ sounded very 1960s US detective movie to me, taking the tones of the evening in yet another unexpected direction. Players of horns old and new: Helena Summerfield, Jim Fieldhouse, Carl Raven, Russell Gilmour, along with Paul Hartley on guitar and Eryl Roberts on drums, all added to the delivery of these quite tricky but wonderfully unusual arrangements. The evening was a true privilege to experience. First up on Saturday were the ‘Cloudmakers Trio’ featuring Jim Hart on vibes, Michael Janisch on double bass and Dave Smith on drums. I wasn’t feeling at my most jazz-ready, but the Cloudmakers did a great job of bringing me round with a set that gathered more and more intensity as it went along. Things really started to hot up with ‘Conversation Killer’, a fast swing track of quite complex rhythmic trickery and dense harmony. It’s the sort of thing that could wear you down, but Smith’s intense drumming kept the excitement levels high, Janisch delivering an awesome solo towards the end. ‘Post Stone’ was a searching piece with abstract drums and a questioning free section, all enhanced by ghostly bowed vibes from Hart, giving the track a disturbing surreality. ‘Angular Momentum’s suitably circular overlapping motifs provided a platform for some great interactive improvising, subtle melodic and rhythmic motifs being traded between the band. A high bar was set early in the day. I was immediately attracted to the spacey swing sounds of the Paradox Ensemble headed up by Nick Walters on trumpet and electronics. Big dense lush harmonies were mashed together with disjoint grooves and lots of intertwining lines, expertly played by the alto, tenor, trombone and sousaphone of Tom Harrison, Ed Cawthorne, Tim Cox and Ben Kelly respectively. Some really juicy flowing drumming from Yussef Dayes bedded the sound down sweetly along with the warm bass of Paul Michael. Ben Cottrell on keys and Anton Hunter on guitar added to the pot with some fine Fender Rhodes grooves and guitar echo atmospherics coming in at astutely chosen moments. Swing became groove became swing groove, all amounting to a joyful noise unto the teepee. Positive vibes for sure. Having already checked out the Moss Project's excellent new album, I was really looking forward to this one. Moss also reminded me that I wrote his first ever gig review here on the Ring Modulator back in 2007, but somehow it’s taken me this long to catch another one of his gigs. Things have changed in lots of ways since then it appears. Freed cooked up some groovy-wah guitar in the set opener, uplifted by the soaring long note vocal lines from the ever-amazing Alice Zawadzki. We were then introduced to author Lawrence Norfolk who read one of a number of writings inspired by the Moss Project music. ‘Anniversary’ opened with some spiky tremolo guitar and sparse violin over the beaten rumbles of Marek Dorcik’s drums. This was soon followed by the repeating Reich’ish figure of ‘What Do You See When You Close Your Eyes’. Zawadzki treated us to some even more soaring violin doubled vocal lines pitched over the bands disjoint groove. ‘Freud and Jung Ride The Tunnel of Love’ proffered some enticing abstract echo reverb guitar and dark violin tones. Once it got going it, perhaps oddly, reminded me of Pink Floyd’s ‘Interstellar Overdrive’ before fully transforming into a rough and dangerous tempest. The band finished with the precise and pushy angular phrases of ‘The Bubble’, Zawadzki and Freed lining up the lines admirably. The song’s strong chorus style hook whipped up some serious momentum, launching Freed into a bitingly angsty solo, followed apace with a Metheny-esque high register bass solo from Kevin Glasgow. This was a fine and refreshingly original set. The project’s writing is great and the band delivered with energy and passion. You can listen to the new Moss Project album in full at the Babel Label Bandcamp page. Monday began late in the afternoon for me with the sweet but mournful tones of Kim Macari’s trumpet at the beginning of the first track from ‘Locus’. 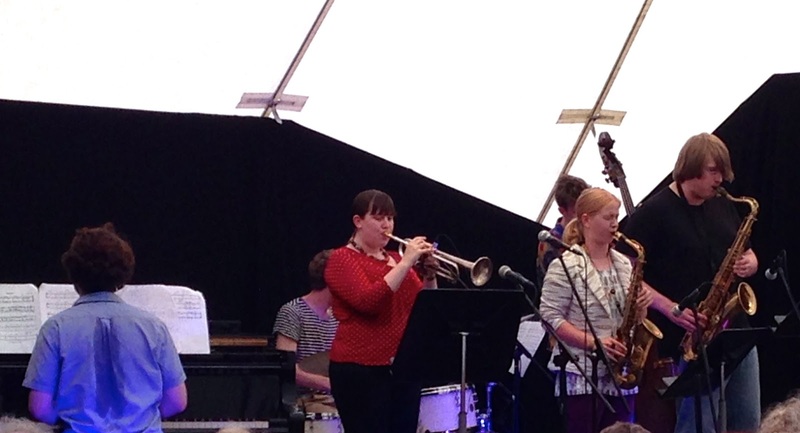 There were some great intricate compositions here, most of which were written by Leah Gough-Cooper on alto sax. It was modern / contemporary stuff, and nicely done. Sometimes the involved harmonies perhaps got a bit lost in the teepee, but on the whole this came across as a strong set. In the evening I caught the latin grooves of Bristol’s ‘Moonlight Saving Time’. The festival program had indicated Cinematic Orchestra and Massive Attack influences, but for me it seemed to come much more from early Return to Forever Chick Corea, especially with Emily Wright’s vocal style having a strong nod to the great Flora Purim. Easy and quite gentle, but also always seductive.